Rev. James P. Sweeney, CSV, died on Wednesday, March 8, 1989 at Little Company of Mary Health Facility in San Pierre, IN at the age of 74. Jim Sweeney was born in Chicago on July 17, 1914, the son of Philip and Mary (Burke) Sweeney. He entered the Viatorian Novitiate in August of 1930. He pronounced his first vows on August 15, 1931 and then attended college at the University of Illinois where he received his B.A. in Latin in 1935. He also received a M.A. in Greek from Catholic University of America in 1938. After theological studies at the Viatorian Seminary in Washington, DC, Jim was ordained to the priesthood by Bishop James Griffin of Springfield on June 12, 1938. Father Sweeney was commissioned as an Army Chaplain during World War II. He advanced from the rank of Second Lieutenant to Captain and finally to Major in January of 1946. He served as a Chaplain for twenty-three months during the Second World War and received a number of citations including a Presidential Citation with Clusters and a Silver Star for gallantry under fire. His service as a Chaplain included time in Southern France, the Rhineland and Central Europe. 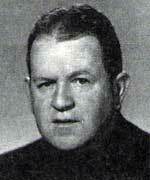 After his discharge in 1946, Father Sweeney left the Community on a leave of absence. After returning to the Viatorians in 1959, he was assigned to teach at Spalding Institute in Peoria where he served until 1966. Following his assignment in Peoria, Father Sweeney served as an Assistant Pastor at St. Charles Borromeo Parish in Port Charlotte, FL as well as a brief service as Campus Minister at the University of Missouri in Columbia. In 1968 Father Sweeney retired to the Via Coeli in Jemez Springs, NM. In recent years he has lived at the Little Company of Mary Health Facility in San Pierre, IN. A Wake Service for Fr. Sweeney was held at the Province Center in Arlington Heights on Friday evening, March 10, 1989 from 5:00 to 8:00 p.m. with a prayer service at 7:30 p.m. A Funeral Mass was celebrated at the Province Center on Saturday, March 11, 1989 at 10:30 a.m. Burial was with the Community at Queen of Heaven Cemetery in Hillside, IL. 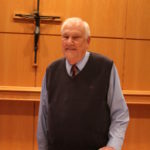 Please include Jim in your prayers and gather together in local communities to remember him at Eucharist. Taken from letter to the Viatorian Community on March 9, 1989 from the Provincial, Rev. Patrick W. Render, CSV.